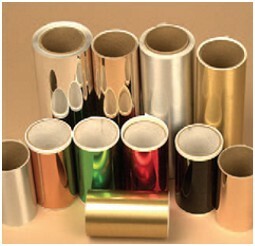 JH1212 Silver, dead soft aluminum foil with a rubber-based adhesive on a white release liner; available without liner 2.8 90 oz. Rubber Greenhouse structures, vapor barrier, air leakage protection, pipe insulation, chemical paint stripping, seaming fiberglass, HVAC sealing and electronic sheeting applications. JH644 Gold and Silver, metalized polyester foil with an acrylic-based adhesive on a white release liner. 3 45 oz. Acrylic Laser engrave on wood, scrapbooking, fishing lures, Corian®, plastics and fabric, decorative trim to frame molding and matboard. JH645 Silver, metalized polyester foil with an acrylic-based adhesive 2.2 45 oz. 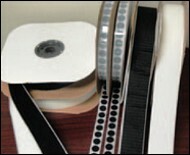 Acrylic Micro film splicing, scanner, separator and reflective sheeting. STEEL Silver, steel/shim tape with a high tack acrylic-based adhesive; available in die-cuts 4.3 74 oz. Acrylic Attach magnetic items to a non-magnetic surface. Make sign changes without mechanical fasteners. 3M5401 Tan, fiberglass cloth tape with a silicone-based adhesive 9.3 12 oz. 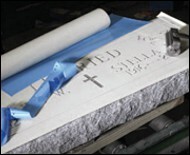 Silicone Provides a traction surface to non-stick surface on rollers for printing, converting and other web processing applications. Scapa 2420 Dimpled, siliconized treated coated cloth tape with a rubber-based adhesive 23.6 19.8 oz. Rubber Provides a traction surface to non-stick surface on rollers for printing, converting and other web processing applications. Tesa 4863 Dimpled, siliconized treated rayon cloth tape with a thermosetting rubber-based adhesive 25 N/A Rubber Provides a traction surface to non-stick surface on rollers for printing, converting and other web processing applications. TH600-TH675 Black or Gray, single coated low density, closed-cell PVC foam tape with a high performance acrylic-based adhesive; available in 1/16" to 3/4" thicknesses .063 N/A Acrylic Automotive, HVAC, gasketing, cushioning, vibration control in speakers, vehicles, electronic components and door frames. TH706-TH725 Black, single coated medium density, closed-cell PVC foam tape with a high performance acrylic-based adhesive; available in 1/16" to 3/4" thicknesses .063 N/A Acrylic Automotive, HVAC, gasketing, cushioning, vibration control in speakers, vehicles, electronic components and door frames.